Farmhouse style dining set centers around a 96-inch two-tone trestle table, surrounded by six ladderback chairs with leatherette cushions. 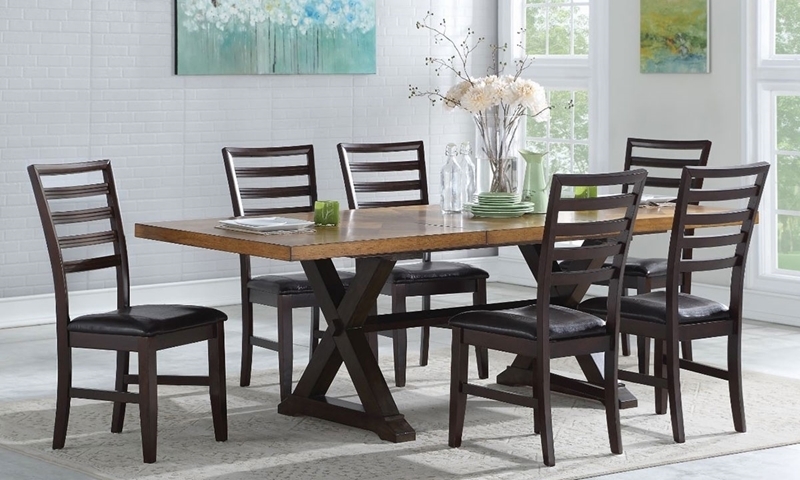 Fill your dining room with elevated farmhouse style perfect for every season. Seat up to eight comfortably at this casual set’s 96-inch table with a dark X-shaped trestle base. Its lighter table top showcases matched veneers in a parquet pattern for a subtle yet sophisticated touch. Six ladderback side chairs in a deep, matching finish with leather-look cushions complete the group. Package also available with two-tone side chairs. See store for details.